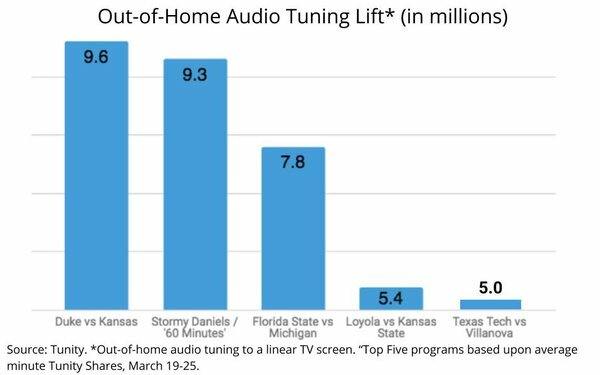 Tunity, a promising new audience data company that matches out-of-home audio tuning on a mobile phone to linear TV screens, has made a surprising discovery about Stormy Daniels' appearance on CBS’ “60 Minutes” Sunday night. Using its proprietary technology to detect TV tuning in out-of-home locations such as bars, gyms, offices and other venues, Tunity found Daniels' highly anticipated interview on “60 Minutes” was one of the highest out-of-home rated shows so far this year. “While losing approximately 25% of her lead-in from the Duke vs. Kansas game, she still managed to rank second for the week in Tunity Share,” says Paul Lindstrom, head of research and analytics at Tunity. As an audience metric, the Tunity Share is a composite metric of traffic, attention, and tuning in near real time for out of home on a minute-by-minute basis. Because out-of-home screens are often “curated” to sports and news, such formats command a disproportionate amount of out-of-home programming distribution. “At home, you can physically change the channel. When you are out-of-home, you can change the channel by changing your focus. This is an important distinction because it currently cannot be measured by current methods such as ACR,” Lindstrom explains. 7 comments about "Stormy Daniels' Out-of-Home Lift Beats Olympics, Tiger Woods Too". Ed Papazian from Media Dynamics Inc, March 29, 2018 at 2 p.m.
All very interesting---but how many people "listened" to Stormy according to Tunity? Ed Papazian from Media Dynamics Inc, March 29, 2018 at 2:01 p.m.
Scratch that last comment---I didn't look at the chart as closely as I should have. John Grono from GAP Research, March 29, 2018 at 8:18 p.m. I'm a tad confused. It's an app on a mobile phone that pumps the audio of the show on the screen into the earphones? Paul Lindstrom from Tunity replied, March 30, 2018 at 9:08 a.m. I may be confused by the question. It seems as if you are asking if at any given point in time in an OOH location you have a choice of porting sound for one of several screens, or porting if there is only one screen or not porting at all. Is that not actually a bit like saying at any given time if there are multiple screens you can choose to watch one, or if there is one set you can choose to watch it, or you can choose to watch none of them. This is certainly true. In this case in a multi screen environment, by following the choice of sound to a given channel we can gain insight into the choice of channel and the dynamics of focus and attention in a multi-screen environment Previously this information was unavailable through ACR or other means. In my opinion, OOH usage of linear TV needs to be a function of traffic and attention. John Grono from GAP Research, March 30, 2018 at 5:32 p.m.
Test. I got a HTTP error and lost my reply. John Grono from GAP Research replied, March 30, 2018 at 5:42 p.m. Sorry for the confusion Paul. What I am trying to understand is that when a consumer is in, say, a gym they can choose to listen to the TV content via the app of their smartphone through their earbuds - a better and more personal experience. Is that basically correct? If that gym has one TV the choice is (i) to listen via the TV speaker, (ii) to listen via the Tunity app through your earbuds, or (iii) to listen to their own content. If that gym has multiple TVs on (it can happen in latge gyms) can the user select which of the tuned TVs to listen to? And just to check, their TV listening choices are limited to the stations that the gyn owner chooses to tune the TVs to? Paul Lindstrom from Tunity replied, March 31, 2018 at 9:06 a.m.
That would be true for gyms and most OOH locations.